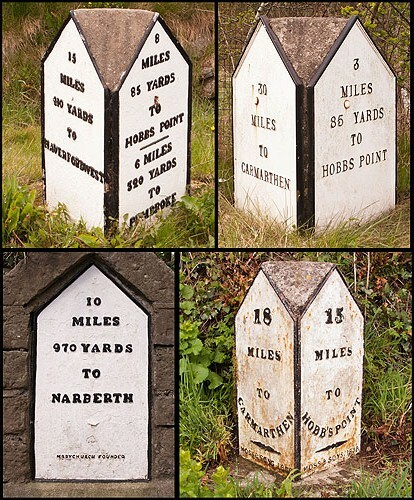 These Distinctive Milestones comprise : 2 cast-ironplates (74cm high x 39cm wide), attached to substantial stones. As a result of the Rebecca Riots the Turnpike Trusts were forced to consolidate within each County and form the "County Roads Board". It was probably after this consolidation that these Milestones were erected (1836 - 40). In 1889 the newly formed Local Authorities took control of all main roads. Pic 1 - A highly visible stone at the Carew Roundabout. The plates may have been made by the foundaries of Joseph Marychurch, Haverfordwest . Pic 2 - A stone about 2km west of the MS in pic1. The lettering appears more delicate on this milestone. One of the recently restored Plates . These 2 styles of plates are on the A477 , the Main Turnpike between Carmarthen and Pembroke Dock (Hobbs Point) . The road was maintained by the "Tavernspite Turnpike Trust" . Pic 3 - A single plate in Tenby on the A478. With the extra inscription - marychurch foundary . Pic 4 - A stone to the West of Llanteg village (A477). There are similar stones at Kilgetty and Llanteg .